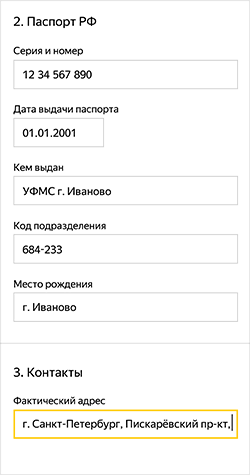 Russian citizens aged 18 to 65 with a valid passport and a permanent income. 1. Find payment in installments on the store's website. 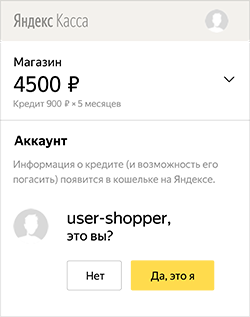 For example, it might be a button named Buy for 1000 ₽ per month (instead of 1000 ₽ the button will show the amount calculated for your product). 2. Select the credit terms (if available, as this depends on the store). The overall amount might or might not include interest. 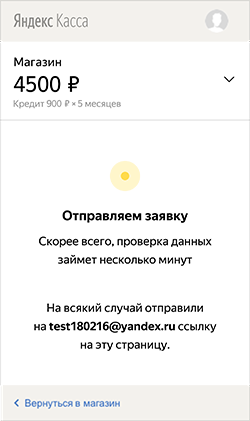 If it does, the grace period will be indicated to the right of the amount. 3. 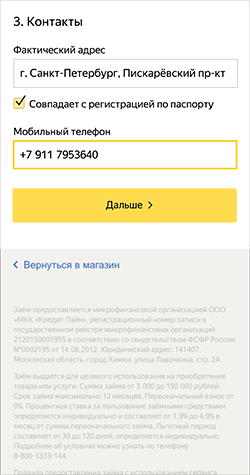 To apply for an installment plan, you will need a Yandex.Money wallet. If you already have a wallet, log in with your username. If you don't, you can create one right away. Confirm that you consent to the processing of your personal information using a text message password. Wait a few minutes for the request to be processed. 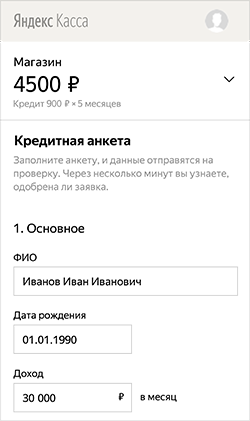 You will receive an email to the address indicated in the form. It contains a link for returning to the installment payments at any time. Additional information required. You will be asked to provide a photo of your passport and possibly another document. After that, the application will be reviewed again. Application was denied. You can't pay using this method. You can return to the store and select a different payment method. Application accepted. You will be provided with an installment plan. Decide if you need insurance and click Next. 8. If your installment plan is approved, you will see the full terms and the repayment schedule. If everything is in order, click Confirm and confirm the payment with a text message password. 9. The order is paid. The store will receive the money. 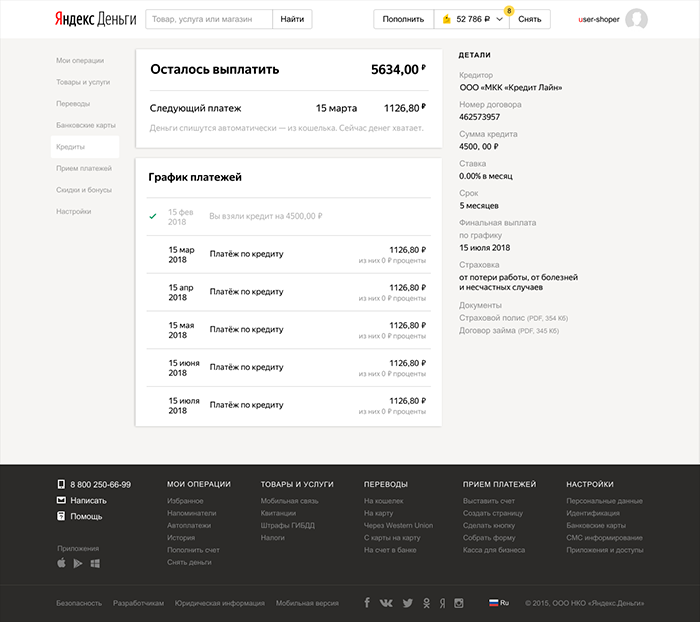 You don't need to pay anything right away, just add funds to your Yandex.Money wallet on time. 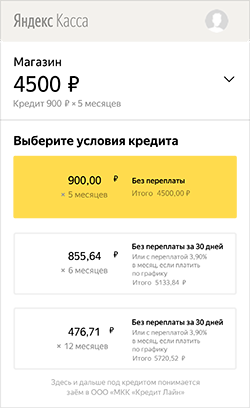 The first payment is on schedule, one month after the purchase. 1. 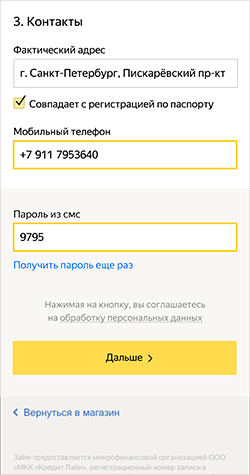 Add money to your Yandex.Money wallet. Funds are debited once a month, before each debit you will receive a text message reminder. If you have insufficient funds, the payment won't be made. 2. You can View the conditions in your wallet, in the Installments tab. The amount left to repay, as well as the schedule of payments are displayed there. Click Repay early in the payment schedule. Make sure that you have the necessary amount on the balance and confirm the repayment. Funds will be debited from the wallet, and the installment plan will be closed. 4. Closed installment plans are available in the wallet: you can view when and how much you paid at any time. If you have any questions or need help, contact our Support Service.